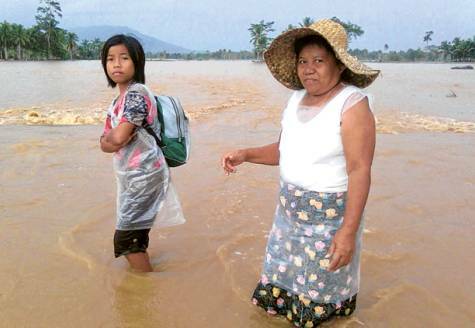 A total of 8,574 families were affected by flooding incidents in Dinagat islands brought about by the low pressure area in East of Mindanao. The municipality of Basilia with 5,018 families (25,090 persons) has the biggest number of affected families followed by Loreto with 1,445 families or 7,224 persons; San Jose with 1,333 families or 6,665 individuals; Libjo with 620 families (3,101 persons); and Cagdianao with 158 family consisting of 792 individuals. Rosario Roxas, Jr., Office of Civil Defense (OCD) Deputized Coordinator said that only 325 families or 1,523 individuals were evacuated by the flooding spawned by the non-stop rain. In Loreto, MDRRMC-OCD Deputized Coordinator, Engr. Domingo Elan Jr. reported that portion of their seawall along Brgy. Carmen was damaged. In Basilisa, six (6) barangays roads were washed out but they are still passable. Most barangays in the said town experienced soil erosion. Meantime, 25 hectares of root crops and banana were reportedly damaged in Libjo. In the town of Dinagat, road slip off shoulder costing P1M was also damaged but it still is passable to all types of vehicles. Roxas said that no injuries/casualties were reported as of press time.